This posts brings R, Praat and Python code I used to write my Phonetics MA paper, as well as the paper itself to download, plus the acquired data. I won’t go into too many details about the downloads, but I will note that I hope they will be of some use to people searching for similar things, approaches – or simply, to see how useful free and open source software is to researchers. The R, Python, and Praat code is hosted on Github under the label r-diphthongs-sr-en (here is the zipped version, which may not be up to date, but again not too different). The software tool that that took me the most time to write was a set of scripts in R language. It was designed to load the data I acquired with Praat and to list tables and create plots (the R plots and diphthongs you can see here). The code takes length, pitch, formants and intensity of diphthongs as the input. A TextGrids with segments for the word/diphthong length, and the referent points in the constituent vowels for data measurement. 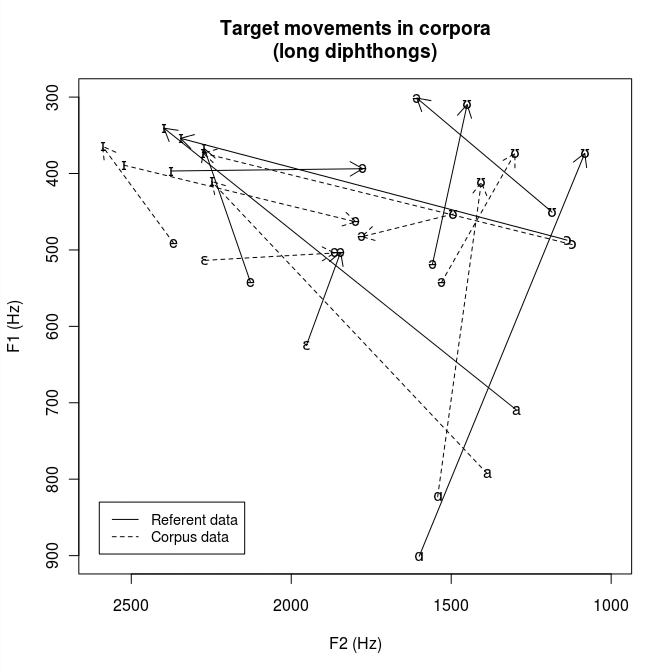 In my research I compared the lengths, formants, intensity and pitch of the selected diphthongs, as pronounced by of a group of female ESL speakers (native language Serbian), with a referent RP speaker. The data (see it here or at the above links) was extracted by using Praat TextGrids (this is how I checked them), and if you’re interested to see which methods and techniques I used to segment the files, you can see this chapter (the link to the integral paper is below). The data linked contains 8 diphthongs in 2 contexts (short/long), as recorded and pronounced by 15 ESL speakers and 1 RP speaker. The diphthongs were pronounced within 32 words (I wrote this script to select the corpus). So, Why Putting All This Online? The most of the code here is tailor-made for my research, and I am aware that it cannot as-is be used in some other project. However, I believe it is a very useful heap of ideas. For example, Praat scripts and TextGrigs show some advanced tips for data extraction and control, which are backed up by a phonetic discussion about segmentation (itself a demanding task). The Python is used for corpus search and integrates a script from NTLK Toolkit to verify the sound signal annotations (as well as for the control of recording, but about that some other time). Finally, R scripts show how custom-made project is limited only by imagination, and how simple operations and filtering can significantly contribute to the final result (what I’m saying here is: don’t use Excel, learn R). This post is about resonant frequencies of a tube, in the context of speech and the neutral vocal configuration. Two formulas are given: the first to calculate the resonant frequencies when the length is known, and second, to calculate the length when the frequency of a formant is known. 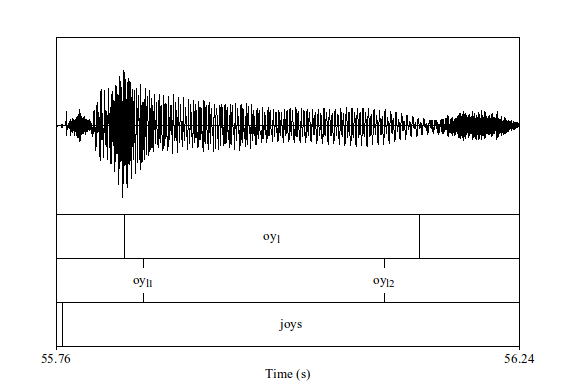 Finally, there is a real-life example: a calculation of a speaker’s vocal tract length after measuring the formants in schwa. Where n is an integer, L is the length of the tube and c is the speed of sound (about 35,000 cm/sec). Tract length is 17.5 cm. Estimated tract length is 8.75 cm, where formant number 1 has value of 1000 Hz. This length corresponds to vocal tract lengths measured in infants. A spectrogram and waveform near the end of a word "abjured". The three red lines show formants, while the vertical line shows the measurement point. Analysed in Praat. Estimated tract length is 15.92 cm, where formant number 1 has value of 549.3043 Hz. This is, it seems, an acceptable value for this speaker. The measurements and image was obtained by using Praat, free phonetic software. Calculation and the code example were written in R programming language.